Total cruise passenger traffic during the second quarter of 2016 amounted to 200,480, a decrease of 2.3 per cent over the corresponding period last year. 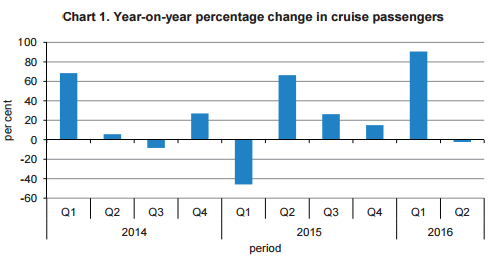 During the second quarter there were 108 cruise liner calls, at par with last year. At 91.2 per cent, transit passengers accounted for the vast majority of total traffic, reaching 182,754. A total of 2,474 passengers visited Gozo, while 4,230 passengers spent at least one night on board their berthed cruise liner. Visitors from EU Member States comprised 73.3 per cent of total traffic, the major markets being Germany, Italy and France. The total number of passengers from Non-EU countries stood at 53,447, of whom 38.9 per cent came from the United States. On a gender basis, female passengers made up 53.6 per cent of the total. The largest share of passengers were in the 60-79 age bracket and were followed by those aged between 40 and 59. During the first half of the year, total cruise passengers stood at 239,855, a rise of 6.2 per cent over 2015. Of these, 72.1 per cent came from EU Member States. The largest increase was recorded from the French market, which advanced by 7,523 passengers. Female passengers numbered 128,375 and were in the majority. Most passengers were between 60 and 79 years old, amounting to 92,909. These were followed by passengers aged 40-59, reaching 74,192. There were 125 cruise liner calls during the first six months, with an average 1,919 passengers per vessel, compared to 117 calls and an average 1,931 passengers per vessel in January-June 2015.